Each of the competing protocols claims to be the best. So how do facility executives select the one that is best suited for the facility? Data is communicated between devices through a Communication Protocol. It is the language that a particular device is able to interpret and forward to other devices on the network. Some common protocols are BACnet, Lon, and Modbus. Protocols must be selected based on the needs of the facility and its ability to support a particular protocol. Each has been used many times to implement an interoperable system. Each has its advantages and disadvantages. Involve your information technology department. They generally are the controlling agency for the facility’s network infrastructure. When selecting a control system choose one where the front end is compatible with a number of protocols. This will give greater flexibility as building equipment and devices change over time. 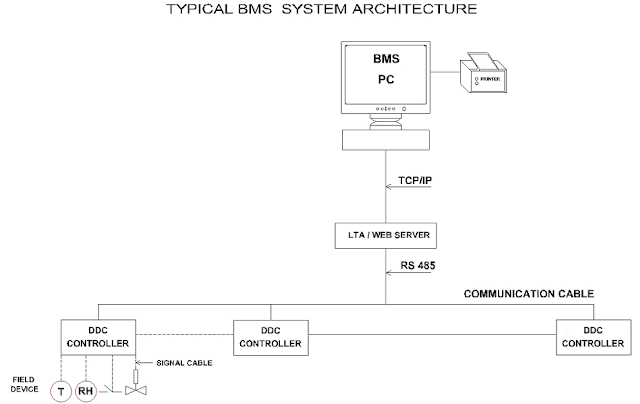 A BMS with proprietary protocols locks the system owner into using a single BMS vendor. For example, you can’t remotely change the set points of a proprietary BMS unless you use the vendor’s software. In contrast, with open and standard BMS protocols you can shop for alternative providers of digital devices and enterprise software. Modbus: Modbus is a network protocol best used for industrial automation systems specifically for connecting electronic equipment. Although Modbus is best for industrial applications, its simplicity allows it to be a useful tool for building automation as well. LonWorks: LonWorks is a communication network protocol useful for building automation applications designed on a low bandwidth, for networking devices through power lines, fiber optics, and other media. 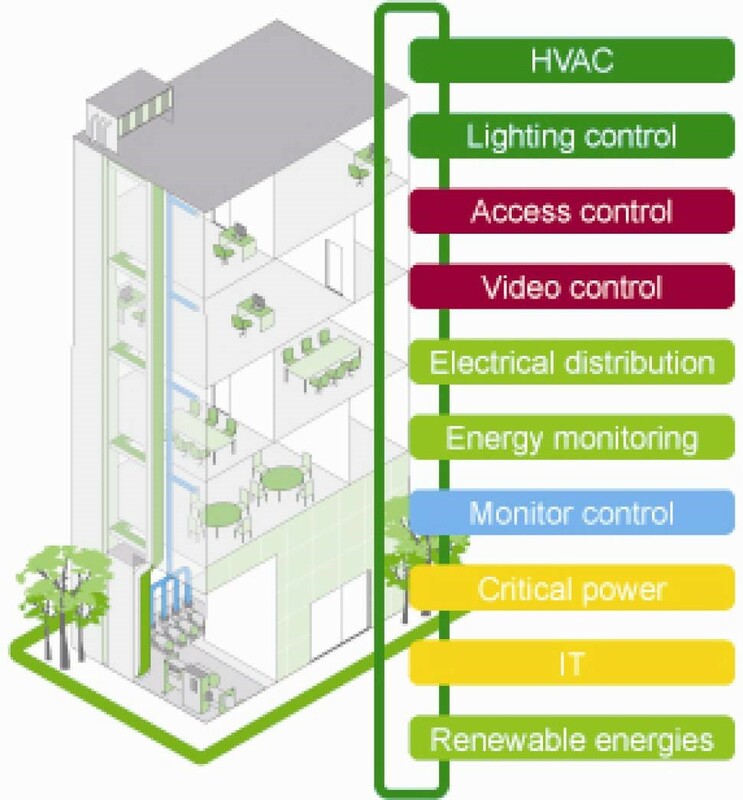 Home automation, industrial, transportation, and public utility control networks. - Limited the number of data types; Large binary objects are not supported. - No standard method for a node to find the description of a data object, i.e. finding a register value represents a temperature between 30◦ and 175◦. - Extensions are allowed only through the LonMark Consortium. - Transmissions must be contiguous which limits the types of remote communications devices to those that can buffer data to avoid gaps in the transmission. - Hardware specific, and requires the Neuron chip for network movement of the protocol. - Close to “plug & play” ability, yet still far from achieving interconnectivity using Microsoft Windows. 1. Can your competitors exchange data with your BMS? 2. Is the system’s protocol published in such a way that it’s easily accessible to everyone (including competitors)? Even the ASHRAE BACNet committee has convened a working group to define use of XML with BACnet systems. The group is also working to define web services that will enable data exchange between building automation and control systems and various enterprise management systems. 1. For devices such as RTUs and refrigeration controllers, look for ones that use open protocols such as BACnet or Modbus. 2. Make sure these devices give you both “read” and “write” capabilities so you can change set points. 3. For easy enterprise access, choose a BMS with web services and XML capabilities. 4. Make sure the web services of the BMS allow both read and write capabilities. 5. Be sure the BMS supplier provides the XML dictionary and definitions of web services to anyone, including competitors. Splice trays are necessary for holding and protecting individual fusion splices or mechanical splices. Splice trays are available for all different kinds of splices, such as mechanical splices from 3M, Corning, AMP and Siemon Company, bare fusion splices and heat-shrink fusion splices, and so on. Normally splice trays should be matched to the type of splice used. A splice tray designed for holding mechanical splices usually cannot be used for bare fiber fusion splices or heat-shrink fusion splices. Although there are splice holding chips you can purchase to make them work, it is not the ideal way. Standard splice trays can hold up to 12 splices and you can use several splice trays together for higher strand number fiber optic cables. The splice tray has room for mounting fiber splices and excess fibers. Fiber loose tubes enter the splice tray at one end and are secured to the splice tray. The loose tube stops at the splice tray end and individual fibers are exposed and spliced inside the splice tray. Optical fiber termination by fusion splicing or mechanical splicing is very common now with the increasing development of fiber optic network. As optical fibers are sensitive to pulling, bending and crushing forces, fiber splice tray is used to provide a safe routing and easy-to-manage environment for the fragile optical fiber splices. In the past, the fiber splice tray was usually installed in a box that mounted to wall. Now, you can find a lot of places in fiber optic network using fiber splice tray. This tutorial is to illustrate where the fiber splice trays are required and how to use them. What Is Fiber Splice Tray? Fiber splice tray is generally used to hold and protect individual fiber optic splices. There are mainly two types of fiber optic splices, one is fusion splices, the other one is mechanical splices. Fiber splice trays for fusion splices and mechanical splices are not the same. It is suggested to use specialized fiber splice trays for different fiber splices. Another important factor of fiber splice tray is the fiber count that it can hold. Most fiber splice tray can hold up to 24 fiber splices. 12-fiber splice trays are the most commonly used fiber splice tray in fiber optic network. For most applications, fiber splice tray is not strong enough to provide robust protection for fiber splices independently, so it is usually used with other components to protect optical fibers. It has low space requirement and has great compatibility. Fiber splice trays are usually used as accessories of other devices, like fiber optic splice closure, fiber distribution box, fiber optic enclosure, etc. The following is to introduce the applications of fiber splice tray in details. The fiber optic splice closure is component which is widely used in today’s fiber optic network for outdoor applications and harsh environment. It usually contains one or more fiber splice tray to provide space and protection for fiber optic splices. Fiber splice trays used in different fiber optic splice closures could have different designs and fiber counts. Here take the examples of a 96-fiber horizontal fiber optic splice closure and a 24-fiber dome fiber optic splice closure. The following picture shows the 96-fiber horizontal fiber optic splice closure. It has two input ports and two output ports providing space for 96 fiber splices. There are four standard 24-fiber splice trays stacked together inside the fiber optic splice closure. The 24-fiber splice closure is shown in the following picture. It has five entries providing up to 24 fiber optic splices in two 12-fiber splice tray. The design of the two fiber splice tray is different from the above ones, which is suitable for the vertical design of the fiber splice closure. In FTTx projects, fiber optic cables from service providers are usually required to be connected with the fiber cables deployed near end users. 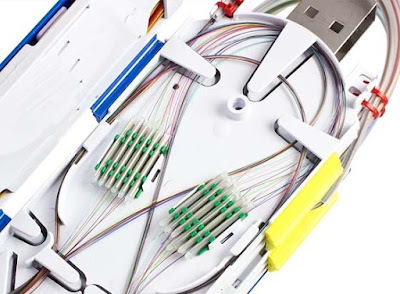 Fiber optic network installers usually splice the feed cable to end users by fiber optic splicing. Fiber distribution box is usually used in FTTx projects to distribute individual fibers to individual end users. Fiber splice tray is usually deployed in fiber distribution box to manage and protect fiber splices as shown in the following picture. Except the above mentioned two applications, fiber splice tray is also very popular in data center and server room. It is usually evitable to splice fiber optic cables with fiber pigtails in data center, which requires lower space requirement and has a better network performance compared with other fiber optic termination methods. Fiber splice tray is usually installed in fiber enclosure to provide a safe and easy-to-manage environment for fiber splices. Here takes the example of fiber splice tray used in FHD fiber enclosure as shown in the following picture. It is a 96-fiber enclosure which has four 24-fiber adapter on the front panel. 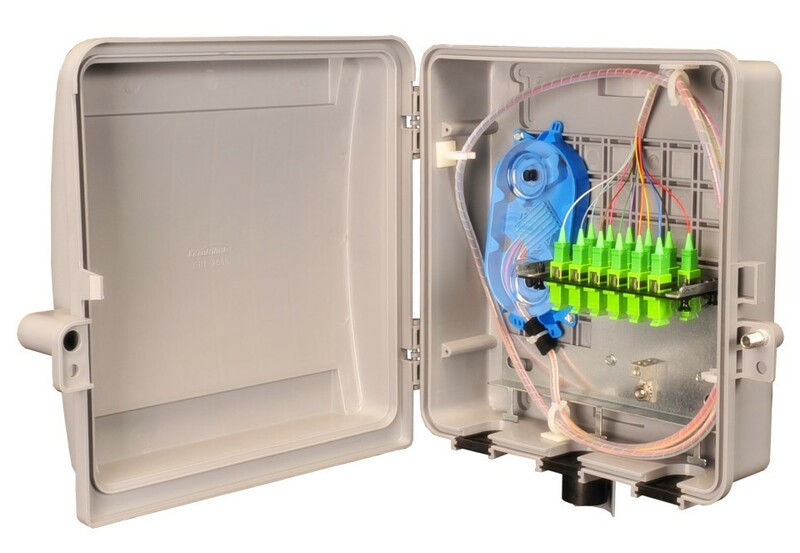 This fiber enclosure can hold up four 24-fiber splice tray to provide the space for 96 fiber optic splices. Fiber splice tray is a simple and easy component to provide space and protection of fiber optic splices done by fusion splicing or mechanical splicing. Be very careful when mounting the splices inside the tray. Minimum fiber bending radius requirement should always be observed.